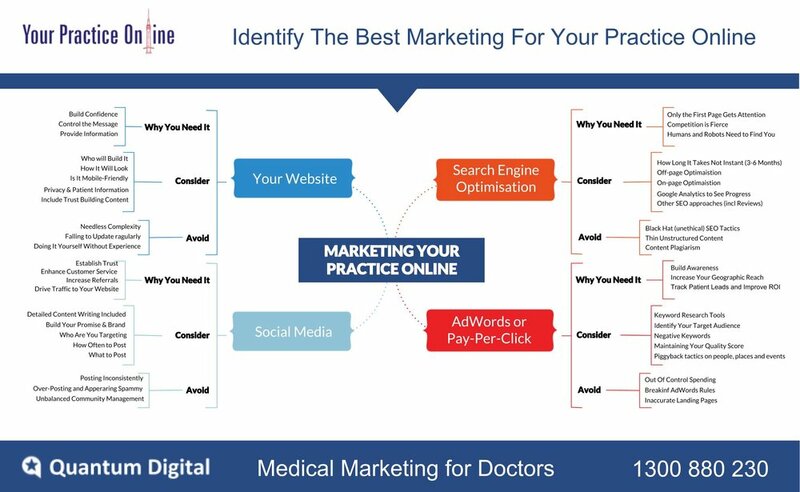 Online Marketing for doctors starts with your medical practice websites, but shouldn't end there - there are 4 steps that you need to take when it comes to Practice Marketing. It Starts With Your Website, but should not End there. No medical marketing plan can be complete without first having a website. While having even a basic website is a great start, for many practices a website is only one facet of a complex and hopefully symbiotic marketing plan. Unfortunately, most websites are not designed to meet even your practice's most basic marketing objectives. While there are many other metrics that should be considered, establishing even these basic outcomes are a good start. Whether you have a website or not 85% of doctors websites add little value toward achieving your practice's basic outcomes. This need not be the case. Even a basic website and a clearly defined marketing plan can begin to address your goals. Having a great website is a foundation element but without visitors it is like a 'billboard in the desert'. Being found online and generating new patient enquiry is a key outcome for most marketing plans. While no two practices are the same and a marketing tactic that has worked for one doctor may not successfully transfer to another medical practice, with experience and analysis, typically specific marketing tactics can be quickly identified. Medical Marketing can offer hundreds of online and offline ways to generate targeted traffic and new patients for your practice, preparing and executing a traffic generation strategy requires; experience, measurement and ongoing analysis. Often, word of mouth or referrals constitute the overwhelming majority of both a practice's website visits and actual new patients. To these referred patients, even a poor website can be effective. The challenge is to attract patients who know what they are looking for (eg: orthopaedic knee surgeon, breast augmentation or a urologist) but do not know 'you'. This is what Medical Marketing is all about. Most medical practices do not have either the in-house expertise or time to execute even a basic medical practice marketing plan. A first step is for us to review your current position, what you are doing and maybe suggest simple wins to start. While Quantum Digital executes very sophisticated plans, most practices start with something small or a narrowly defined proof of concept. This simple plan can show how our focused 'method' works and your outcomes can be measured.